Our garden to be found behind high walls, is, in many ways, the main “room” at La Divine Comédie. It is the largest private garden in Avignon. The owners Amaury and Gilles wanted to create a true haven of calm and tranquillity in the heart of the city. The garden at La Divine Comédie isn’t just an afterthought: just like our interiors, each element has been carefully designed to create a sense of peace and harmony. Enjoy a stroll through the grounds, and, between two high bamboos, you may come across some of our smaller, friendly visitors! 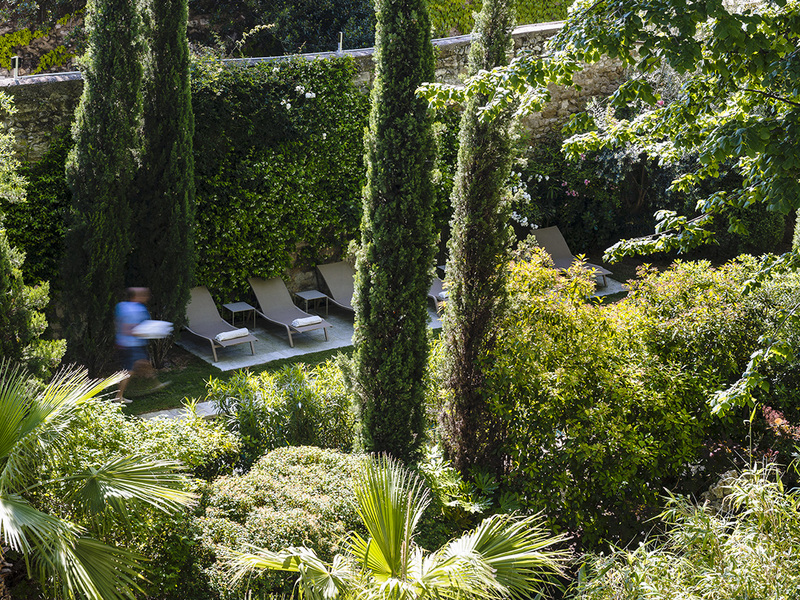 Our well-being suite is set in the garden, like a secret island in this sea of green. Slip into the jacuzzi and let all your troubles simply melt away. You will surely experience something new. Take a moment out of time, an immensely relaxing experience in the shade of our ancient trees, and enjoy the fabulous views of the Popes’ Palace! In the heart of the garden, away from prying eyes, you’ll find our 15-metre swimming pool, which deep blue will enchant your senses. Next to it, an elegant metallic structure, set amid luxuriant greenery, houses our well-being suite. Step away from the bright sunlight into soft semi-darkness, lit only by flickering candles, and enjoy some serious pampering.